Time to Lay It Down: The Soundtrack of the Vietnam War explores the music created during the Vietnam War, which expressed the deep divisions in the U.S., and provided a life line for GIs in Vietnam, as well as a source of healing when they came home. Perfect accompaniment to the Ken Burns' 10-part series The Vietnam War broadcast starting September 17, 2017 and airing throughout fall 2017, as well for broadcast during Veterans and Memorial Days. Time to Lay it Down: The Soundtrack of the Vietnam War airs Sunday, September 17, 2017 at 12 noon on WRUR/WITH. It will encore Tuesday, September 19, 2017 at 6 p.m.
Part 1: Vietnam... a war with a rock 'n' roll soundtrack. But there's so much more to that soundtrack than most of us realize. 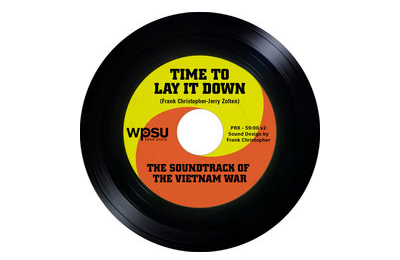 Tune into... Time to Lay It Down ~ The Soundtrack of the Vietnam War and listen to the music that expressed the deep divisions about the war, and provided a life line for GIs in Vietnam, as well as a source of healing when they came home. You’ll hear folk, country, blues, R&B and Rock from the Vietnam War era, and the voices of musicians such as: Noel “Paul” Stookey and Peter Yarrow of Peter Paul and Mary, Tom Paxton, Country Joe McDonald, Stax recording artist William Bell, Graham Nash, John Fogerty, Merle Haggard, Kris Kristofferson, and Marvin Gaye. Part 2: The second hour of the two-part series, Time to Lay it Down ~ The Soundtrack of the Vietnam War. Listen to the soundtrack of the Vietnam War as it was heard in Vietnam, a discordant mix of radio broadcasts, bootleg music, and songs created and sung by Americans and Vietnamese, all against a backdrop of terrifying combat sounds, clashing with voices from the American government promising victory.